If you’re looking for a tropical island holiday where you can swim in pools under beautiful waterfalls, spend time at tropical palm tree lined beaches reclining in a hammock enjoying a laid back lifestyle and diving/snorkeling in a coral sea, the Maldives is an ideal destination. These islands offer many family activities and the shallow lagoons are ideal for kids to swim in. With some resorts offering child minding, there’s also the opportunity for adults to enjoy some quality time together. The location of the Maldives, south west of India, means that the flight will be time-consuming and expensive. Therefore, to make the holiday worthwhile, plan to be on the islands for at least a week, or even better two weeks. With 26 atols and over 1000 islets, most people simply opt for being based on one of the biggest islands. Malé, traditionally known as the King’s island is the current capital. Malé is also the most ‘real Maldives’ island, packed with locals not necessarily employed in tourism. Streets busy with marketplaces and interesting colourful office/housing blocks, abound with island residents going about their daily business in paradise. Malé is also the cultural hub of the Maldives, with the Tomb of Medhu Ziyaaraiy (bringer of Islam), the Mulee-aage Palace (first a residence for exiled Sultans then the President), the National museum (packed with historic and Royal family artifacts) and Sultan Park (if you’re craving some green) being just some of the highlights. Tours to other islands and activities such as big-game fishing expeditions are also on offer. As alternatives to Malé, choose Kuramathi, a large resort island with three hotels and excellent choice of restaurants, Madivaru island for the Robinson Crusoe lifestyle and fantastic diving, child-friendly Bandos island for diving, palm trees and great beaches, Cocoa island for the archetypal huts on stilts over water and world class spa and snorkelling, Sun Island simply for the best beaches in the (inhabited) Maldives, Nika Island (with only 10 apartments, each with private beach you’ll need the readies!) 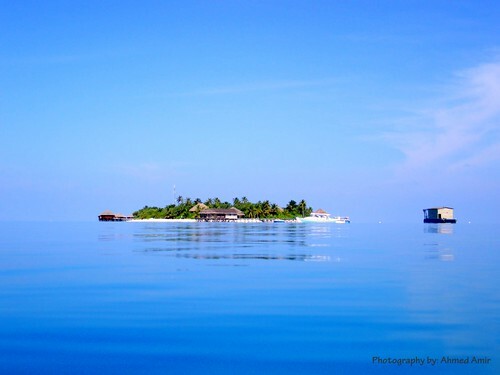 and Veligandu island for excellent off-shore diving and its own tropical jungle. Finally, the lagoon at Mushimas Mighili is out of this world, coming complete with colourful corals and playful fish.